Talented tool-maker Curt Knitt has designed a better mousetrap — a new Concentricity Gauge that makes it easier than ever to get fast, repeatable results when measuring case and bullet run-out (aka “eccentricity”). The breakthrough design feature is the large-diameter wheel which spins the case. With most other concentricity gauges you must rotate the case with your finger(s). Anyone who has tried this knows that it is difficult to get a full, 360° rotation of the case without disturbing the indicator. Typically you can get two-thirds of a rotation or so, but then you have to reposition your finger to complete the rotation. Moving your finger often causes the case to jiggle or move slightly, and more often than not, the dial indicator jumps a bit, interrupting your measurement. Been there, done that. 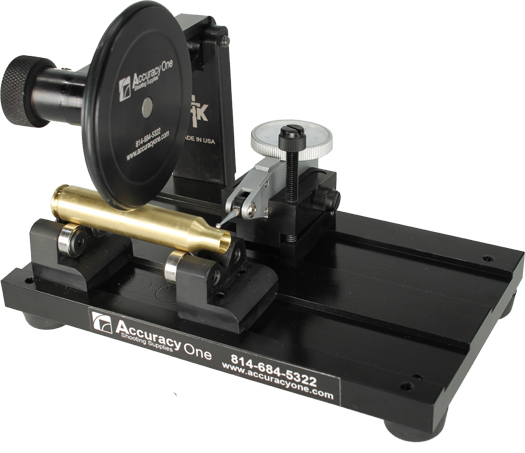 With the new Accuracy One Concentricity Gauge from CTK Precision, the rubber-rimmed drive wheel has a much larger diameter than any cartridge case (7:1 diameter ratio on magnums). So, when you rotate the drive wheel just a half-turn or so (using knurled knob on the wheel axis), you can easily and smoothly turn the cartridge three (or more) full rotations. The drive wheel maintains a constant, even load on the case, so the case doesn’t wobble and the dial indicator gives a continuous, un-interrupted read-out. What’s more, clever cartridge support design geometry pulls the case back against the rim stop as you engage the drive wheel. This holds the case in position laterally during measurement. Morever, this allows very fast one-handed operation. You don’t have to hold the case down with your fingers while maintaining side force against the case rim stop. 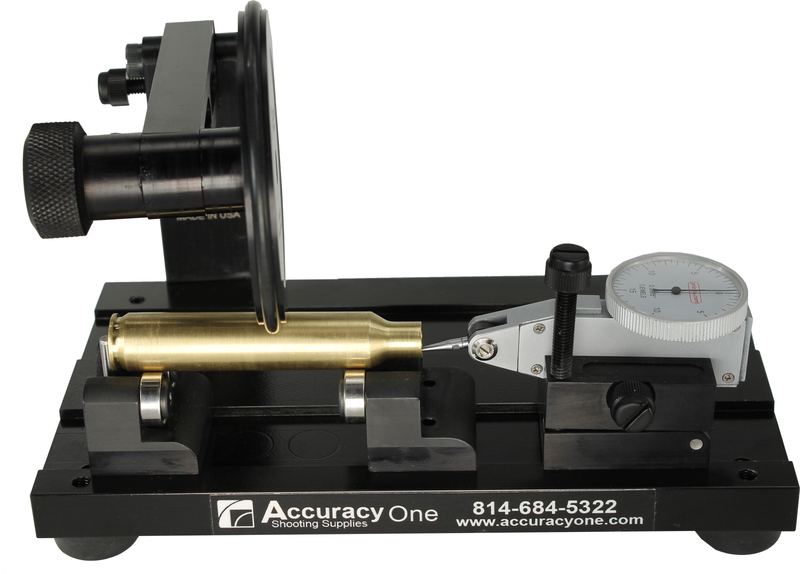 The Accuracy One Concentricity Gauge works with the full range of cartridges — everything from .22LR to .50 BMG. Adjusting the tool for different-length cases is incredibly easy, because the roller blocks (case supports) are held in place by magnets. You just slide the blocks to the desired position — no tools needed! The indicator stand is also held by magnets so it can slide to any position you want along the case body or bullet. And, the indicator can be moved to the front rail and rotated 90°. This way you can measure on the inside of the case neck. Does this new design really work? Absolutely — it works brilliantly and it’s FAST. Watch the video and see for yourself. We could do two-rotation (720°) measurements on cases in a third the time it takes to do a one-rotation gauging operation with other tools. And the actual measuring operation can be done one-handed, leaving your free hand to pic up the next case (or bullet) to be measured. And yes, this tool can also measure bullet concentricity — measured from tip, ogive, bearing surface, and/or boatail. 1. Directional Drive Wheel pushes the cartridge or bullet into the stop for accurate, repeatable readings with equal pressure. The replaceable rubber drive ring will not harm cartridges or bullets. 2. Two-position bullet and cartridge stop. 3. Precision ball bearings provide friction-free movement. 4. Heavy steel base with E-coat finish and bolt-on rubber feet. 5. Indicator stand and roller blocks ride in machined slots and are held in place by N42 Neodymium magnets. This allows rapid, smooth, tool-free adjustments. 6. Indicator stand can be place in front OR rear machined slots. This allows for both internal and external measurements. 7. Fine-Adjustment Horizontal Indicator Stand allows very precise indicator angle/load adjustments. 8. Indicator Stand will accept horizontal indicators that are .350″ wide or narrower, and are 1.75″ to 2.25″ from the indicator contact point to the center of the main body. 9. Adjustable mechanical arm stop holds the arm up for one-handed operation. 10. Precision Drive Wheel has a 13:1 ratio for .22 rimfire, 7:1 for magnums, and 3.7:1 for 50BMG. 11. 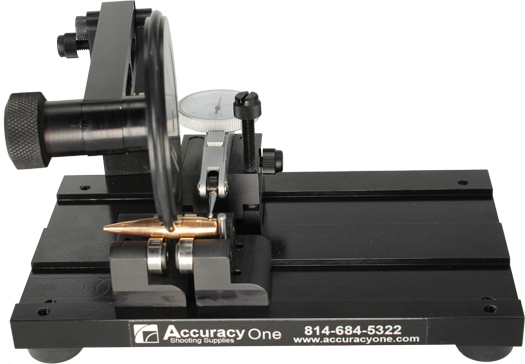 Concentricity Gauge accepts cartridges from .22LR rimfire to .50 BMG. 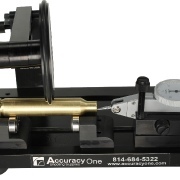 The Accuracy One Concentricity Gauge is available from BulletTipping.com. Price for the unit, complete with quality horizontal indicator, is $325.00. Price, without indicator, is $280.00. The initial run of Concentricity Gauges is now in final production. Gauge sets should hit the market in 4 to 6 weeks. To place an advance order, fill out the PDF Order Form, or call (814) 684-5322. 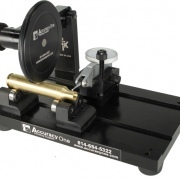 To learn more about setting up and using this new tool, read the Concentricity Gauge Instructions, and watch the video above. 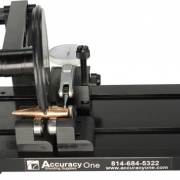 Share the post "New Wheel-Drive Concentricity Gauge from Accuracy One"